About the same time that the North Shore Line sought and built a bypass route for their interurban, the Chicago Aurora & Elgin decided to do the same, with similar results for the Chicago Rapid Transit Company (CRT), the private owner and operator of the "L" at that time. In June 1925, the Chicago Westchester & Western Railroad was organized to built the bypass for the CA&E, which would leave their main line at Bellwood, turn south to 22nd Street, then proceed west to rejoin the interurban's Aurora branch near Warrenville. The CA&E's predicament was not nearly as dire as the NSL's had been, as the track on their original main line was a higher quality and population around it was less dense. As such, the bypass was to be built in leisurely phases, the first of which was a mile-long branch from Bellwood Avenue in Bellwood to Roosevelt Road in Westchester. Conveniently (and perhaps not so coincidentally), this branch served a 2,000-acre tract of land belonging to associates of CA&E president Thomas Conway, Jr., which was quickly sold to developers, divided into lots, and sold. In this truncated state, the new line was a branch rather than a bypass and was of little use to the CA&E. So, the CRT was made to operate this short branch rather than the CA&E. To serve it, the "L" extended some Garfield Park trains from Desplaines Avenue to Roosevelt Road. 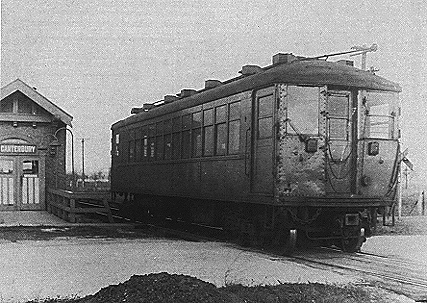 These trains reached the Westchester branch via a line that was built as part of the CA&E's predecessor's original main line from Wheaton to 52nd Avenue and which had opened on August 25, 1902, the same day the Metropolitan Elevated's Garfield Park branch was extended to 52nd Avenue; the "L" and interurban met and transferred passengers there. Westchester "L" trains not only served stations on the branch but also served local stations along the CA&E main line between Desplaines and Bellwood at 5th, 11th, 17th, and 25th avenues, relieving the CA&E of this burden. Upon operation by the CRT, the CA&E ceased boarding any passengers on its eastbound trains and discharging any from westbound trains between Desplaines and Bellwood, although they could still serve stations between Bellwood and Desplaines for the purpose of delivering passengers originating west of Bellwood and for the purpose of picking up westbound passengers traveling beyond Bellwood. The Westchester extension was dedicated on September 30, 1926 with a three-car train carrying officials, reporters, and other guests. Service began at 12:34am on Friday, October 1, 1926. According to the Westchester Tribune, the new service was celebrated on Saturday and Sunday, October 2-3, with "a Texas barbecue, fish fry and other features... held at the William Zelosky Company office along Roosevelt Road." William Zelosky was Westchester's leading developer. The company planned to make Westchester a model suburb, with wide streets, careful zoning, and provision for a civic center, parks and playgrounds, with about ten percent of the total area reserved for public use. Except in the very early morning when all Westchester trains were locals, trains to and from Roosevelt Road had a very elaborate timetable of various types of express runs to the Loop. Eastbound, trains in the morning rush and midday typical made all stops to Desplaines, then skipped some combination of stations to Canal Street (depending on the time of day), then made all stops to and around the Loop. Afternoon rush and evening eastbound trains were locals. Westbound, all trains at all time from the Loop skipped at least some stops, with the fastest express runs in midday and the evening rush. To accommodate these express operations, as well as faster CA&E trains, an express passing track was added at Gunderson in addition to the passing tracks at Desplaines, Laramie, and St. Louis. These Westchester expresses were far more useful to residents of Oak Park, Forest Park, and Maywood than the few inhabitants of Westchester, which was just as sparsely-populated as Niles Center at the time. Express trains ran every twelve minutes on a 13-cent fare schedule for one way or 25 cents for the round-trip. The single adult fare to any point on the newly developed line west of Desplaines Avenue was seven cents, while the single fare of a child up to 12 years of age for any point west of Desplaines Avenue was three cents or six cents for trips east of Desplaines. School tickets for children from 12 to 16 years of age could be purchased in books of fifty for $2.50. Adult weekly passes for Westchester patrons could be bought for $2 each and could be used anywhere on the new service, anywhere in the city of Chicago, Cicero or Berwyn. It is interesting to note that, according to Mr. Moran, commercial manager of the William Zelosky Company, the Chicago Rapid Transit Company plainly expected to lose money on the Westchester branch project. Moran was confident, however, that as Westchester built up the territory would eventually provide a fertile ground for ridership and would be profitable if the rapid transit company provided the service the territory would need. And naturally, as boosters for their development, the Zelosky Company predicted that development would boom quickly and property values would skyrocket. 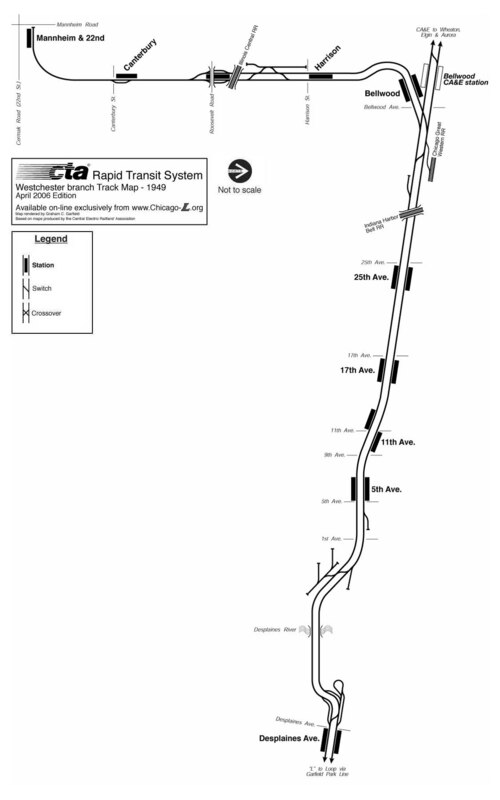 The company pointed to areas such as Uptown, Ravenswood, and Albany Park as other areas which, once good rapid transit service was provided, quickly developed. They saw the same future for Westchester. What they could not predict, of course, was the approaching Depression. Construction of a further extension of the Westchester branch commenced in 1927, although apparently in secret at first. The January 13, 1927 issue of the LaGrange Citizen newspaper cited an anonymous source at the CRT as saying that the company had put out a crew of men to lay tracks from across the street from the Roosevelt terminus with orders to go on "at least as far as Twenty-second street." The secrecy of the work may have had something to do with the fact that permission had apparently not been granted yet to allow the "L" to cross Roosevelt Road. On December 1, 1930, a mile-long extension was added from Roosevelt to 22nd & Mannheim. This single track extension served an area even more lightly populated than the rest of the branch. The 22nd & Mannheim terminal consisted of little more than a tiny wooden station house (later removed) and a short wooden platform. While the reasoning for such a extension might seem questionable, the 22nd & Mannheim station was adjacent to the site that was to contain the village Civic Center in Westchester's master plan. The site, which would have served as Westchester's downtown, was to have contained the village hall, a library, a fountain and a "cultural hall". Instead, all that the property would contain was grass and weeds until after World War II. Service on the extension was first operated by one-car shuttles to Roosevelt Road, where passengers could connect to Loop-bound expresses. This was more than ample, and soon the ticket agent's job at 22nd Street was eliminated due to a lack of traffic. The shuttle was replaced in 1930 with a car that was coupled to and from Loop-bound express trains dispatched from Roosevelt Road. Little changed in Westchester operations for almost two decades. When the Depression hit in 1929, development in Westchester ceased. Mirroring the situation in Niles Center, where the "L"'s other new branch line was located, the lots sat empty and streets and sidewalks slowly deteriorated and became overgrown with weeds. There was little to feed traffic to the fledgling rapid transit line. Development in Westchester resumed in 1940, but its pace was still slow and short-lived, as World War II soon struck and once again put a damper on major construction. Defense workers did, however, build two hundred homes between Roosevelt Road and Harrison Street during the war. After the CTA took over operation of the "L" in October 1947, they began studying all of the services and making changes to improve performance and efficiency. Although Westchester service would be short-lived under the CTA , they did make some small changes to the service during its brief tenure under the Authority. As they did on many routes, on February 19, 1950 revised the operation of the Westchester branch to try to realize some economies on the relatively-lightly used branch. 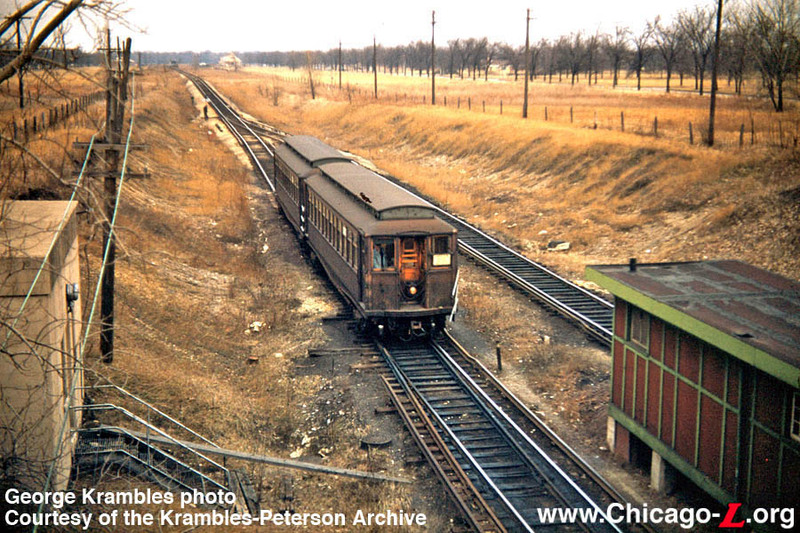 From this date, Garfield Park-Westchester through trains from the Loop were truncated back to Roosevelt Road. Service from Cermak/Mannheim to Roosevelt Road was provided by a rush hour-only shuttle Monday through Saturday. No service was provided south of Roosevelt at other times. Beginning on April 28, 1950, an unusual fare collection system was put in place. During off-peak hours when fares were collected onboard trains, conductors began using unique hand registers to collect and register the fares. The registers accepted "plasticoins", small colored plastic discs not unlike a poker chip, with a small green one for full adult fares and a larger red one for half-fares. Passengers gave their fare to the trainman, who in turn issued the proper plasticoin to the passenger. The passenger than inserted the plasticoin into the trainman's hand register, after which the trainman pulled a trigger on the register which registered the fare and released the plasticoin out the bottom of the register. Thus, each trainman only carried a few plasticoins, since passengers didn't take them with them; they were only needed for the brief transaction when the fare was paid. It was not altogether clear why the CTA instituted this rather overly-complicated transaction just for someone to pay a fare to a trainman; simply having the passenger hand their money to the conductor or collector to log on a fare register would be far simpler and there seem to be few, if any, advantages to the back-and-forth plasticoin transaction. Perhaps the CTA was testing a new, experimental onboard fare collection method and the Westchester branch was an easy place with light traffic to test such a thing without disrupting a busier service. Or perhaps the reason behind it was something altogether different. Whatever the case, the Westchester's days were numbered. Following the reorganization of Lake Street service in 1948 and North-South services in 1949, the CTA set its sights on streamlining the rest of the West Side lines. The Westchester branch was a low performer and therefore was targeted for elimination. Although the all-time highest traffic levels for the branch were attained in 1946, the numbers began to steadily decline again after that. While construction in Westchester resumed after World War II, boosted by financial programs made available by the Federal Housing Administration and the Veterans Administration -- 180 new homes were built in 1949 and another two hundred were planned for 1950 -- by 1950 it was still too sparse to support a rapid transit line, by the CTA's standards. Unfortunately, although at the time the population in the suburb was still sparse and diffuse, the indicators were all present that it would likely develop and fill in in short order, and had the CTA been willing to hang on for a while the line may have developed significant enough traffic to justify the service. Certainly, the ability to serve the Eisenhower Expressway corridor and perhaps some of the suburbs served by the former Westchester branch would be beneficial today. But the CTA likely also did not see the Westchester branch as fitting in with its vision for its rapid transit system, regardless of traffic levels, which it saw as trunk lines serving high-traffic corridors, with buses feeding the "L" from surrounding lower density areas. As such, on December 9, 1951, service on the Westchester branch was suspended as part of an overall reorganization of the Garfield and Douglas services. Service was eliminated west of Desplaines Avenue and the former Westchester service was replaced by the #17 Westchester bus. The bus route more or less mimicked the route of the old branch, operating from Desplaines station via Desplaines, Madison, 25th, Madison, Bellwood and Westchester to a terminal loop running clockwise around Westchester, Canterbury, Balmoral, and Roosevelt. 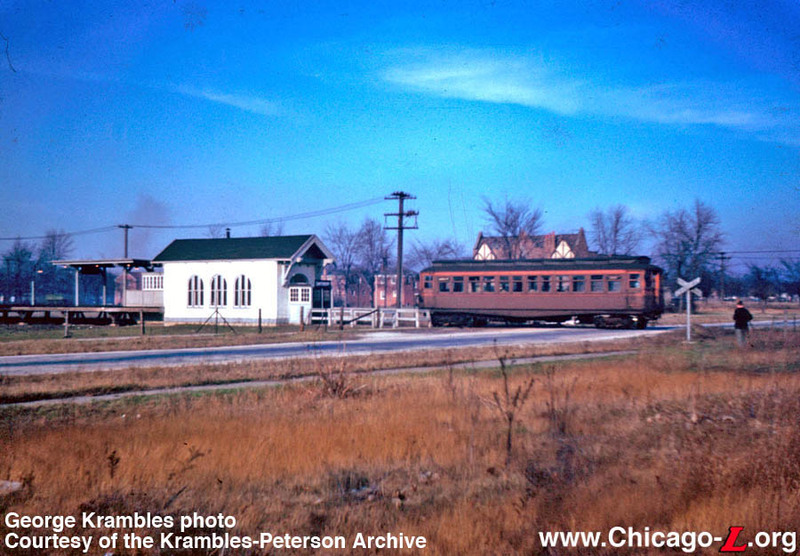 In September 1952, Monday-Saturday service was extended south to near the old Cermak/Mannheim terminal, operating via Westchester, Cermak, Mannheim, Balmoral, and Roosevelt. Service south of Roosevelt to Cermak was later reduced to weekday rush hours only and was eliminated altogether in 1982. Owl service was cut in 1976 and weekend service was eliminated in 1992. The CTA still operates the #17 Westchester bus today, and it appears on maps as an unusual outlier in the CTA bus system, operating in territory normally covered by the Pace suburban bus system. Such is the lasting legacy of the former Westchester "L" branch. 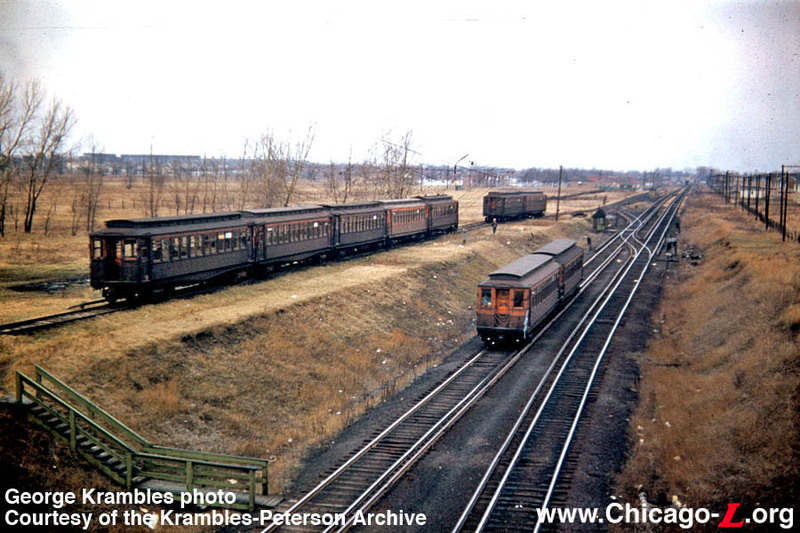 Following the suspension of "L" service, the CA&E continued using their main line between Desplaines and Bellwood for regular interurban service until they discontinued all passenger service midday on July 3, 1957. The CA&E main line west of Desplaines was transformed into the Prairie Path, a 61-mile multi-use limestone trail commonly used by bicyclists, joggers, and hikers. The Prairie Path was the country's first major rails-to-trails conversion and the first nationally designated trail in Illinois. The trail was first established in 1966, with various extensions added throughout the years. The branch itself, south of Bellwood, simply fell into disuse and the rails, stations, and other infrastructure were eventually removed. However, there are several remnants of the Westchester branch in Bellwood and Westchester. Although there is nothing as obvious as tracks or stations, there are numerous places where the path of the right-of-way is still clearly evident because of unusual linear open spaces, the path of telephone poles, or the way other infrastructure is placed to accommodate the long-gone line. For instance, the bridge that took the Illinois Central's Iowa Division over the branch is still present, although part of the passage underneath has been filled in. In addition, Roosevelt Road has a odd rise in it west of Westchester Boulevard, where it once went up and over the "L" tracks. Rather than re-level the street, the viaduct was simply filled in, leaving the profile intact. In the pre-CTA era, a strip of land north of and paralleling 22nd Street west from Mannheim Road had been acquired for the further extension of the intended bypass line. However, this land was sold after World War II for back taxes. The current occupant of location of the Mannheim/22nd station is the Mid-America Bank in Westchester. Moffat, Bruce, The "L": The Development of Chicago's Rapid Transit System, 1888-1932 (CERA Bulletin 131), Chicago: Central Electric Railfans' Association, 1995.